GN design drilling mud trip tank for petroleum drilling mud circulation system.GN mud agitators and centrifugal pumps are components for the mud trip tank .With GN experienced engineers,our selection for the mud mixers and trip pumps are compatible for the trip tank. divisions, used to ascertain the amount of mud necessary to keep the wellbore full with the exact amount of mud that is displaced by drill pipe. When the bit comes out of the hole, a volume of mud equal to that which the drill pipe occupied while in the hole must be pumped into the hole to replace the pipe. When the bit goes back in the hole, the drill pipe displaces a certain amount of mud, and a trip tank can be used again to keep track of this volume. The mud tank adjacent to the shake shaker, usually the first tank in to which mud flows after returning from the hole. Also called a shaker pit. 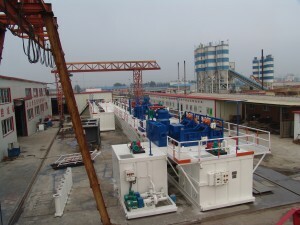 GN manufacture not only full package mud system,but also independent components and equipments for solids control,like mud mixing tank,mud agitators,trip tank,trip pump etc. Awsome blog! It always amazes me how simple some things really are! Always good to see new innovations in the drilling industry. Interesting post. PLEASE, SEND ME THE INTERIOR DESIGN OF MUD SYSTEM TANK. ALSO PLEASE ADVISE ABOUT THE ROLE OF DITCH PATH FROM SHALE SHAKER TO THE OTHER COMPARTMENTS.